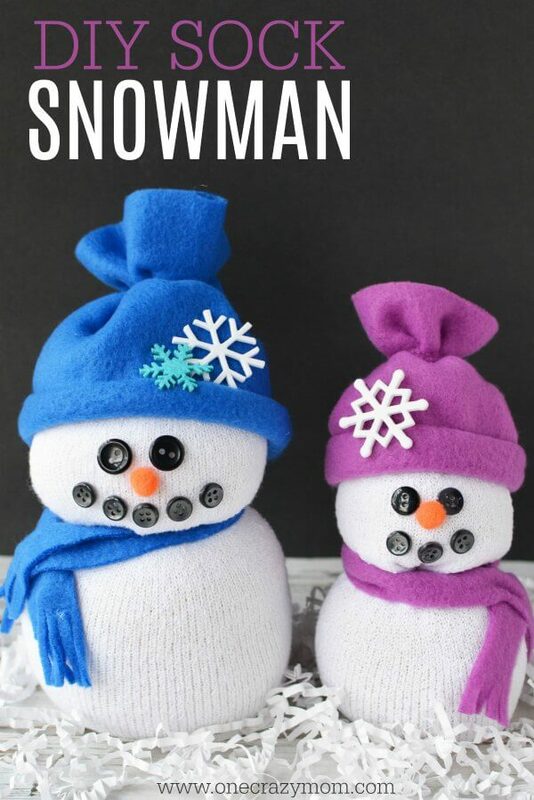 We love sock crafts and this Sock Snowman Craft does not disappoint. The kids will love helping with this fun craft. 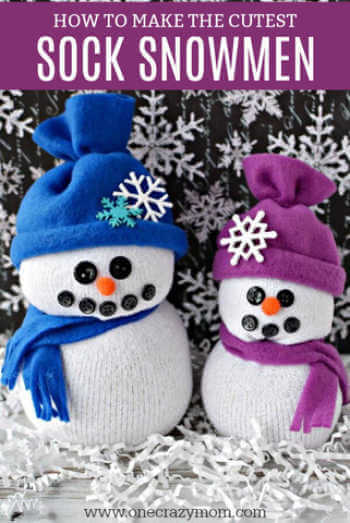 Each snowman has a little scarf and hat. You can let the kids choose the color! This is a great craft to try over Christmas break when you need to keep the kids busy. Not only it is so fun to make but it is such a cute decoration. We have even given these as gifts. This is such an easy craft but the results are just adorable! I like to order the socks on Amazon to make this even simpler. Another idea is to grab them from the dollar store. They worked fine for this. Adult Socks say “Fit Shoe Size 6-11” and the Child Socks say “Fit Shoe Size 6-8” and they are a white sock crew style. 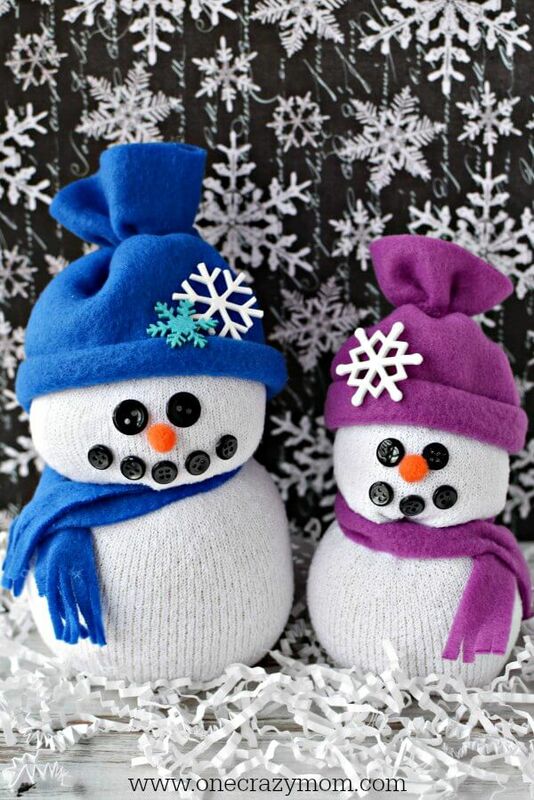 You can even jazz things up and use a patterned sock colored sock to make one of these cute sock snowmen. You can pick up snowflake stickers at your local craft store but I order them on Amazon because they are cheaper. I can get a huge pack for less than a small pack at my local store. We do a ton of crafts so I like to have them on hand anyway. 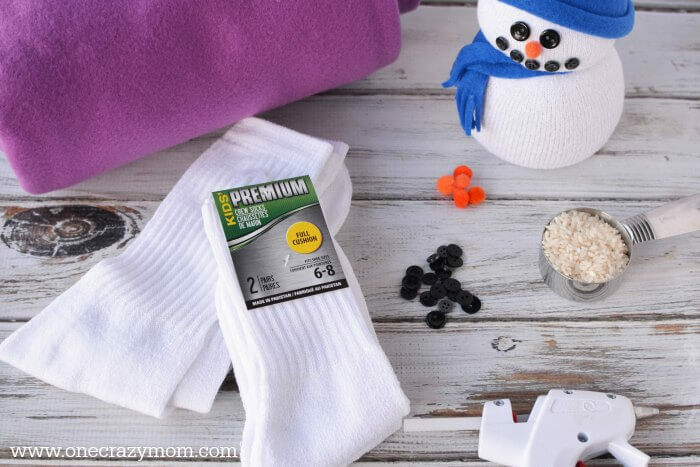 Make sure to have a glue gun for this sock snowman craft with rice. You will need a glue gun and glue sticks for this project. I recommend having an extra bag of glue sticks on hand. It seems I always need more glue than I realize. It’s not fun to run out mid project…..Not that this has happened or anything. 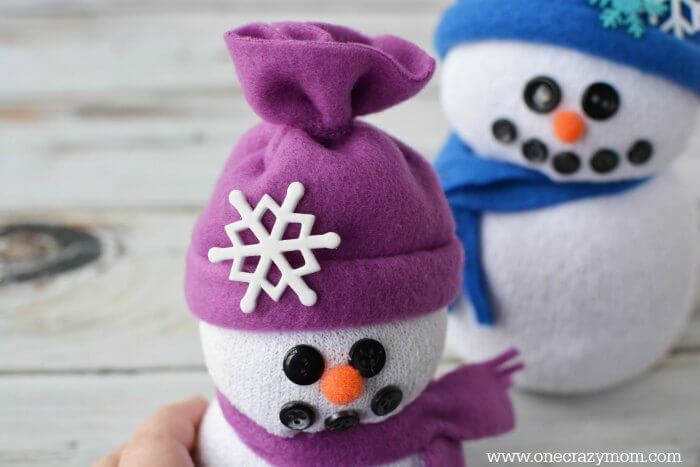 Let’s learn how to make Snowman Crafts! The kids will have a blast helping and everyone will enjoy spending time together. 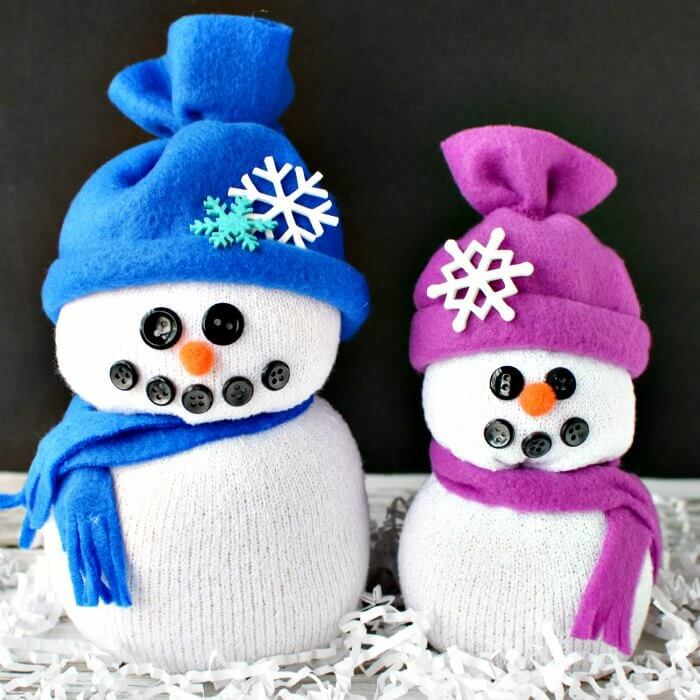 This Dollar Tree sock snowman is so cute and easy to make! 2. Roll down the cuff of a sock and place a rolled paper plate into the sock. 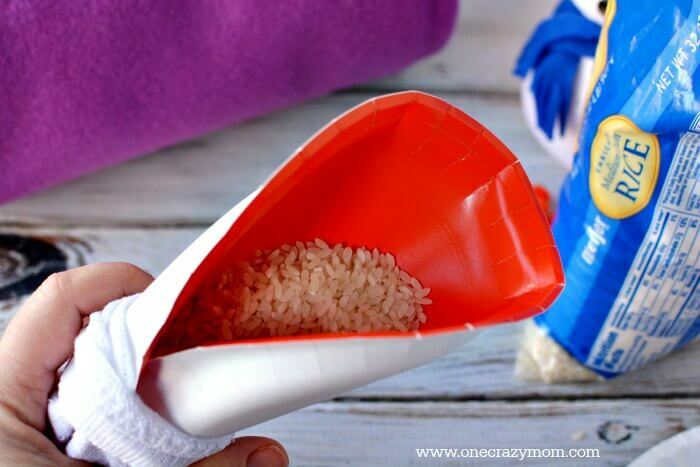 This will create a funnel to use to fill the sock with rice. Pour rice into your sock. Remove the plate. Shake the rice down into the bottom of the sock filled with rice. 3. Secure the sock with yarn or ribbon and tie the top. You can use a rubber band here if desired, but I fear they will rot and fall apart and then your snowman craft will be no more. Close the top and secure tightly with a double knot. Trim excess string from the snowman body. 4. 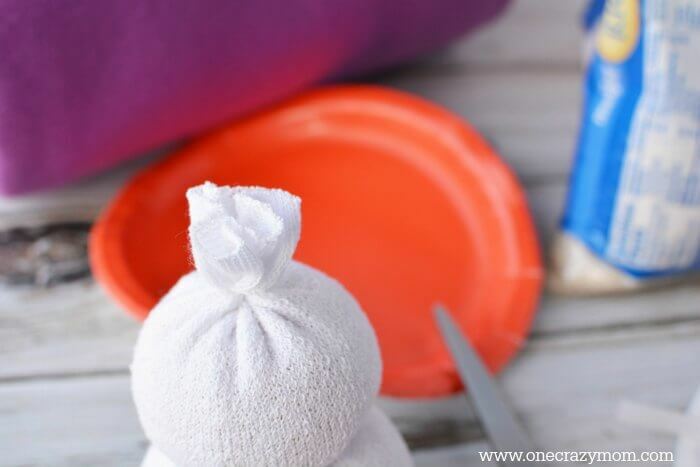 Return the paper plate to the sock and pour in more rice to create the head. You may need to pay attention to the sock as the heel may create an awkward head on part of the sock. Make sure the heel portion of the sock is on the back. Secure the sock just as you did for the body. 5. 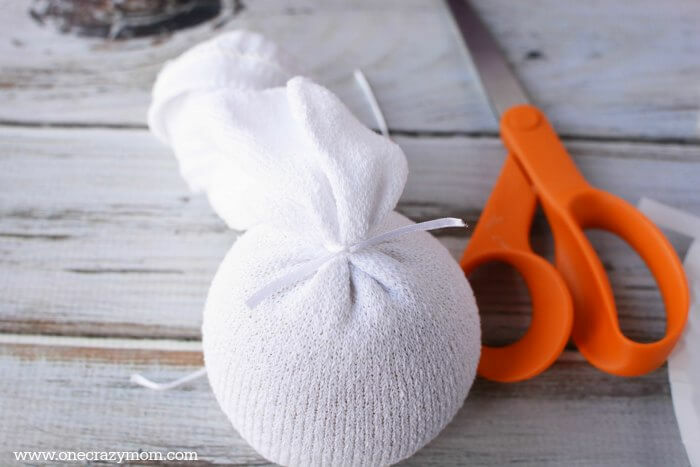 Trim the top of the sock and discard based on the size of your snowman. 7. Fold the long edge of the hat up, twice and secure with hot glue. This will create the brim of the hat. 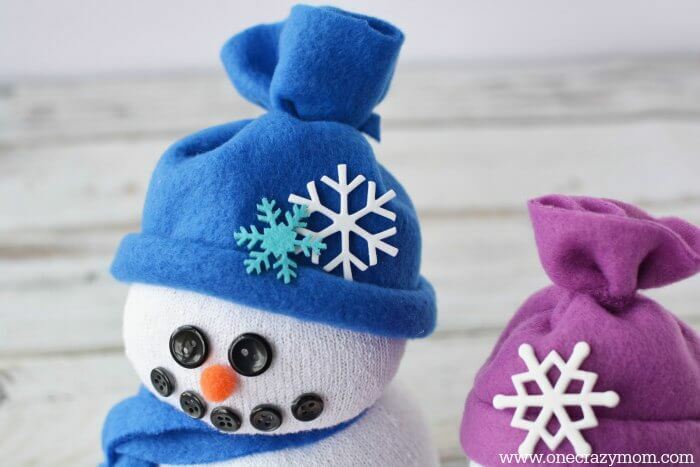 Wrap the hat around the snowman‘s head and attach together in the back with hot glue. 8. 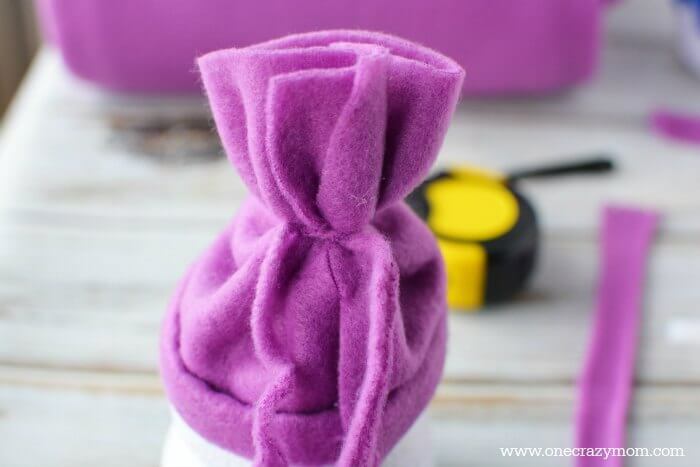 Gather the top of the hat and secure it with the thin strip of fleece by tying in a double knot. If desired, trim the top of the hat with scissors. 9. Trim the ends of the scarf to create fringe. Wrap the scarf around the snowman and adjust as desired. Trim ends if necessary and re-cut fringe to create a scarf. Secure the scarf where it intersects with hot glue. 10. 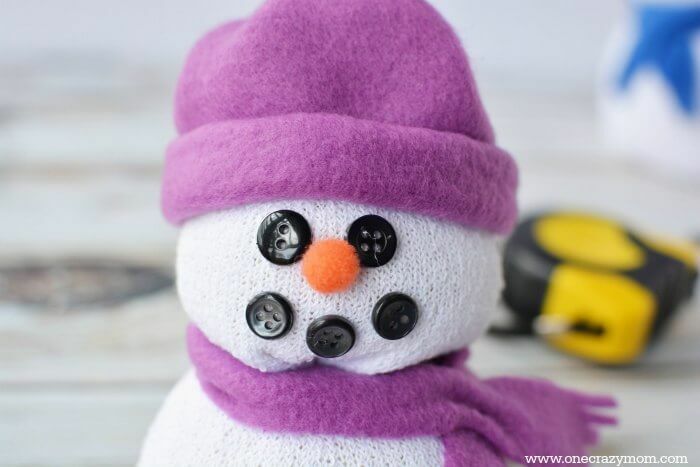 Add buttons or you can also use black beads for eyes and a mouth on the snowman. Add a pom pom nose. Secure with hot glue. 11. Attach foam snowflake stickers with hot glue on the hat if desired. 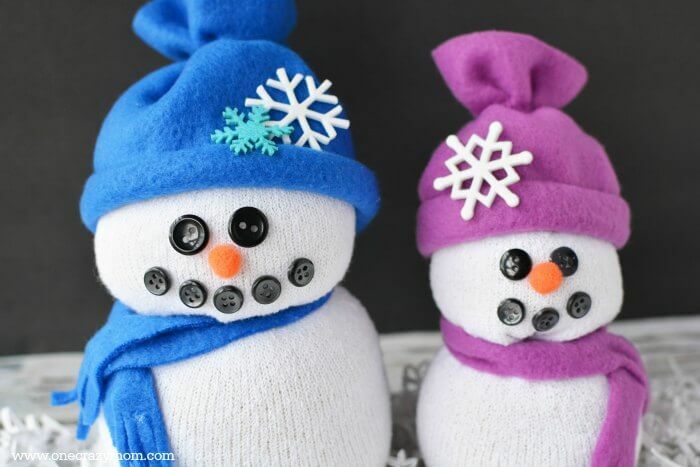 This sock snowman pinterest idea is so fun! Give them a try and let us know what you think. 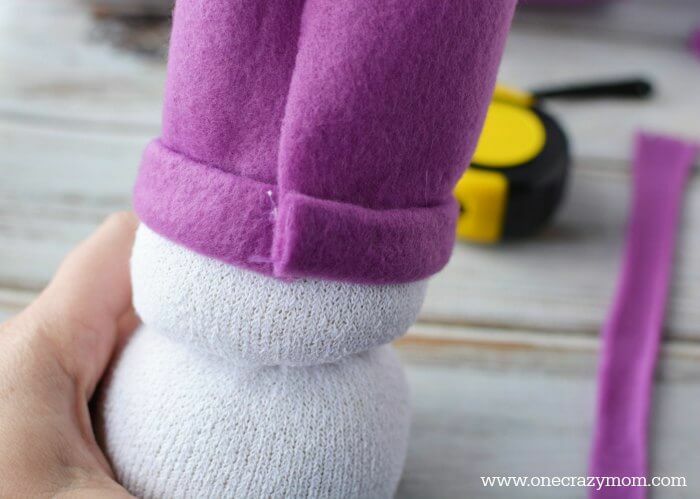 The kids will love learning how to turn the sock into a fun sock snowman craft! You can also try sock snowman without rice for another idea. 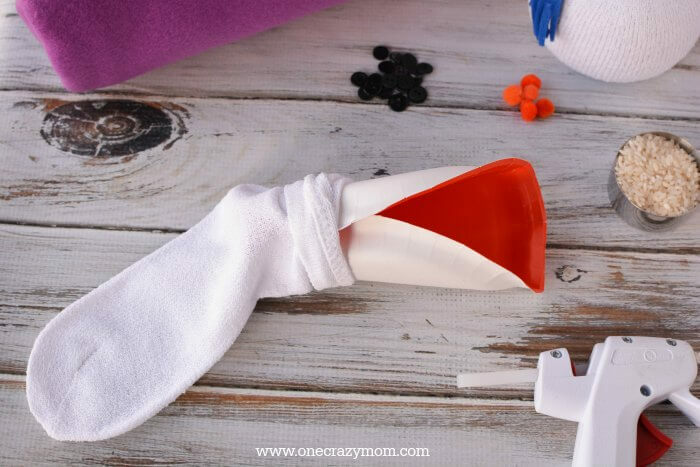 The kids are going to have a blast making these sock crafts! We have so many traditions we do each year and these are truly the things that memories are made of. 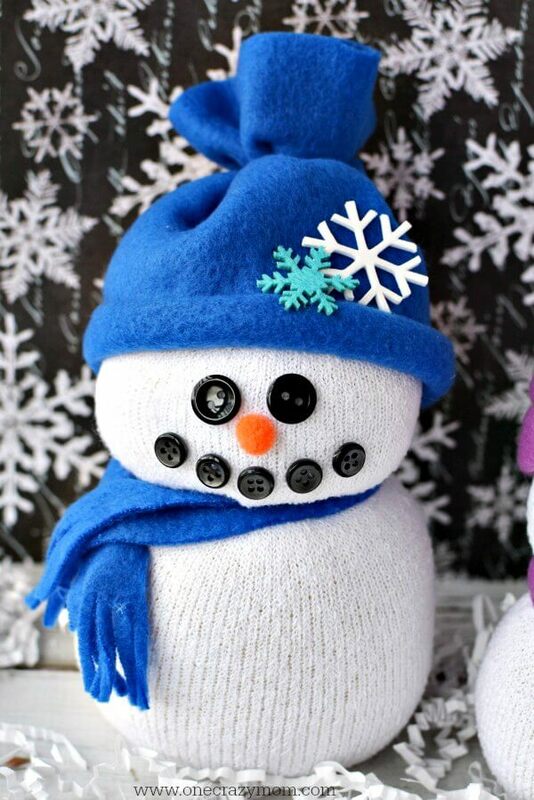 Add this adorable sock snowman to your list of traditions to continue year after year. The entire family can get involved and it’s sure to be a blast. It doesn’t have to be pinterest perfect to create lasting memories. So, get in there with the kids and just have fun. They will remember spending this precious time together for many years to come. We love making homemade gifts and everyone seems to love them. Not only do we have so much fun making these gifts but everyone seems to love them. 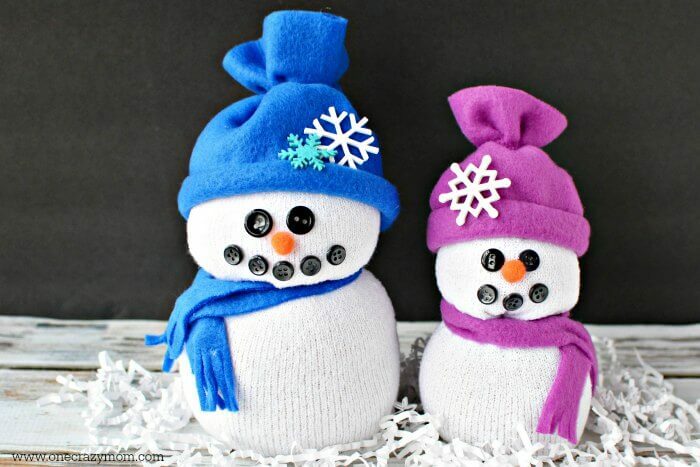 One idea I plan to do for several people on my list is make them a gift basket with various goodies and tuck one of these adorable sock snowmen inside. Throw in a Christmas coupon book and maybe some Homemade Peppermint Sugar Scrub and you have a really thoughtful gift. Grandparents love stuff like this. I find it is hard to shop for people that seem to have everything and these make really great gifts. 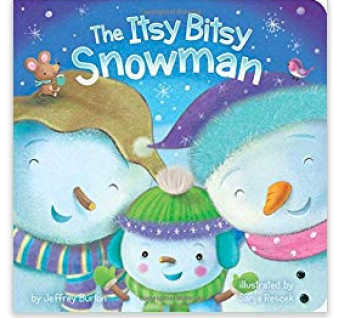 We also have made some of these cute little snowmen and paired it with a fun snowman book or coloring book for a great gift for kids! Pick up a snowman coloring book at the dollar store or order on Amazon for a really fun gift. Everyone will feel so special with these hand made gifts. Homemade Christmas coupons are so thoughtful and really special for those people in your life on your Christmas list. If you are looking for a gift that will make someone feel loved and cared for, try making a homemade gift. Everyone will love it! Learn how to make Homemade Playdough Recipes that your kids will go crazy over.